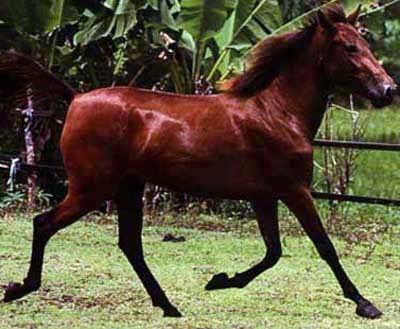 Padang Ponies are from Sumatra Island, Indonesia. They are one of several ponies found in Indonesia. Among the others are Batak (Deli), Bali, Gayoe, Java, Sumba or Sumbawa, Sandalwood, and Timor ponies. Padang Ponies are small but strong, versatile, have good endurance, and are even tempered. They stand approximately 12.2-13 hh at the withers. They have small heads, small ears, a short, muscular neck, deep chest, sloping croup, sloping shoulder, good coupling, strong back, slight builds, and light legs. They come is all colors. They have thick manes and tails.